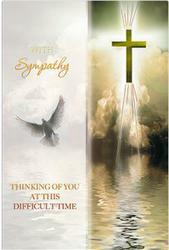 DIVINE CHRISTIAN GIFTS - Sympathy & Mass Cards. Deepest sympathy cards and mass cards depicting the apparitions, Jesus the Good Shepherd, Sacred Heart of Jesus, Immaculate Heart of Mary and St Joseph. Sympathy Mass Card - St Anthony. Sympathy Mass Card - Holy Family. Sympathy Mass Card - Our Lady of Grace. Sympathy Mass Card - Sacred Heart of Jesus. Sacred Heart Sympathy Mass Card. Get Well Prayer Card - 3 Dimensional. Sacred Heart of Jesus Sympathy Mass Card. Mass Card - Our Lady of Grace. Mass Card - Virgin Mary.